Truth is, I’ve never worked out for 21 days straight in my life, even when I played varsity tennis in high school, I spent many afternoons either doing homework or hanging (I guess Wimbledon wasn’t on my radar). Over the years I’ve had an on again, off again relationship with fitness. I remember hanging with my parents at the gym, escaping the confines of the kiddie room to explore the grown up world of rowing machines and saunas. Kind of odd to be the only 10 year old in a step class by decades but nevertheless my muscle memory is eternally grateful. Somehow my childhood curiosities didn’t turn me into a “gym rat.” (I guess Ms. Muscle & Fitness wasn’t on my radar either). Nevertheless, as an adult I’ve tried to balance gym life with living life; taking the stairs, ditching the shopping cart and having dance marathons with any toddler available are acceptable workouts. Running for flights, although not planned definitely count as high impact! Any opportunity to stay fit collects interest over time. Fitness is a great investment- it always pays! For me most days it’s a mix of weight training, yoga, running and tennis (in that order). Despite the line up looking like the line to buy an iPhone, I make an effort to practice surf, stressing practice, since most people think a few times on a board constitutes as surfing. The upside is that paddling out (not standing up) is the real workout so the more you try the more ripped you can be! 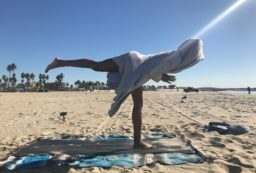 Most of us take a 360 approach to wellness, and since food and fitness go together it was no brainer to start sharing “sweat knowledge.” The exercises for this fitness challenge come from a number of places; training that I regularly do, things that I am learning to do better and things that I think will help other people. 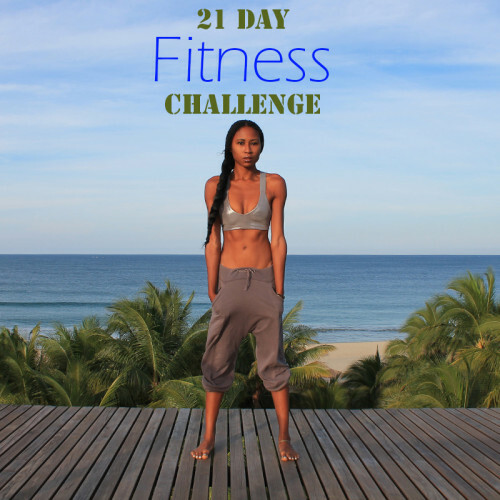 I’ll be referencing a few of my fit-spirations and their workouts to mix things up a bit. Some will require equipment like access to a swimming pool and some will require nothing but yourself! Whether you’re looking to lose weight or gain muscle (like me) or just looking for new ideas, check out my top workouts from the challenge from 2 of my favorite personal trainers in this 21 second clip.